Photo credit to David Levene. British prime minister David Cameron is gearing up to fight the toughest campaign of his life to win reelection on May 7. Nevertheless, his announcement earlier this week that he intends to serve out two terms — and no more — has started the race to determine his successor. Despite Cameron’s efforts to signal that he will step down in 2020, there’s no guarantee that Cameron will be so lucky. The next Conservative Party leadership race could start immediately after the British election if Cameron leads the party to defeat or, possibly, after 2017 when Cameron has pledged (if reelected) to hold a referendum on continuing the United Kingdom’s membership in the European Union. But even if the Tories win a renewed mandate (an outcome that seems more likely today than at any time in the past two or three years), a second Cameron term will now become even more consumed by the debate among his would-be successors to define the party’s future. Notwithstanding the planned 2017 EU referendum, the party’s next leader will determine whether the Conservatives should be relatively more pro-Europe or anti-Europe in an era that features the rise Nigel Farage’s populist and eurosceptic UK Independence Party (UKIP). 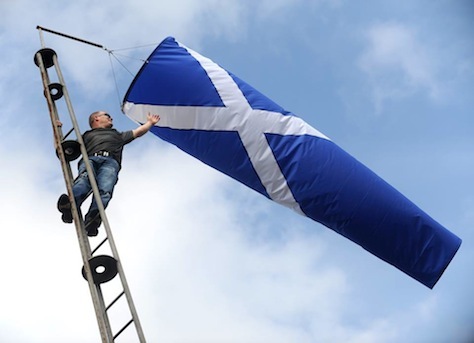 The next Tory leader will also face a fragmenting political environment that appears to be transitioning from a two-party to a multi-party system and a growing sense of constitutional crisis in the aftermath of last September’s referendum on Scottish independence. Moreover, the next Tory leader will also have to choose between two strains of economic policy — a pro-market Thatcherite approach or the more centrist ‘one nation’ Tory approach of her predecessors that concedes a stronger role for government social welfare. Obviously, a lot depends on timing — a leadership contest in 2015 could bring a different result than a contest in 2017 or 2019. Cameron, in his remarks earlier this week, singled out Johnson as well as chancellor George Osborne and home secretary Theresa May as particularly strong candidates. 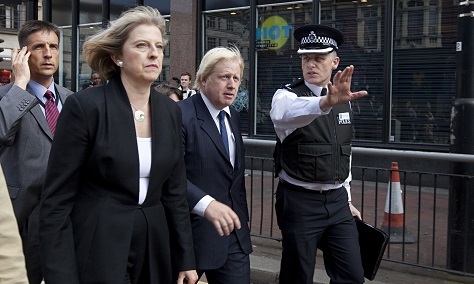 Though Cameron almost certainly prefers Osborne, whose leadership stock is certainly on the rise as the economy improves, the two frontrunners today are clearly Johnson and May (pictured together above), whose personalities and approach to politics and government couldn’t be more different. It was certainly the kind of move German chancellor Angela Merkel would never have made. Surprising reporters and many members of his own party alike, British prime minister David Cameron earlier this week announced that he will not stand for a third term — that is, if he and the ruling Conservative Party win reelection on May 7. George Osborne, the chancellor who’s taken as much heat as Cameron for the budget cuts of the past five years and who, insiders say, Cameron prefers as his successor. It’s too soon to tell if the strategy will help Cameron and the Tories win what has become a very tight race with the center-left Labour Party. On the one hand, it’s a little presumptuous for a British prime minister to look past an election in just over five weeks’ time to proclaim that he won’t be running for reelection in five years’ time. 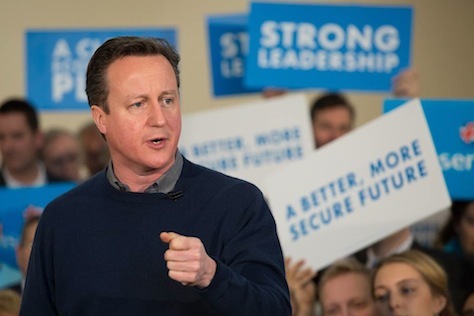 Cameron’s shot at winning a second term is precarious enough as it is. Moreover, there’s a real question that he’s now made himself a lame duck for the second term, which promises to include a tough 2017 referendum on the country’s membership in the European Union if Cameron wins. What happens, by the way, if the Conservatives win a shaky minority government in May, lose a confidence vote in early 2016? Will Cameron resign when early elections follow? (Notwithstanding the new law purporting to establish fixed-term parliament.) Needless to say, it’s not the most intuitive step for a prime minister to launch a slow-motion leadership race so close to a general election. On the other hand, it’s not out of character for Cameron, who’s never seemed to crave the premiership in the same way as former occupants of 10 Downing Street. 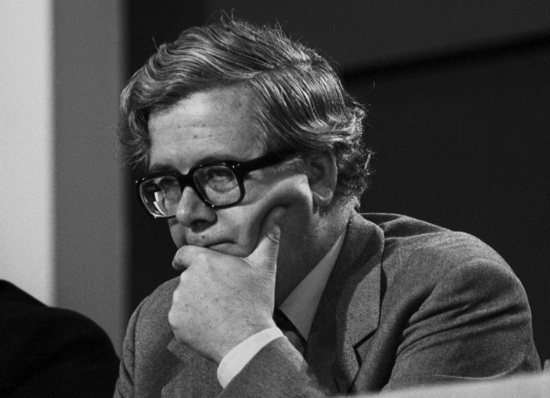 It stands in contrast to Margaret Thatcher, who said he hoped to ‘go on and on’ after winning a third term and who finally left office after 11 years as a result of Tory regicide or to Labour prime minister Tony Blair, whose chancellor, Gordon Brown, pushed him out after a decade of intraparty sniping. Though the British media will spend this week talking about Cameron’s statement, the succession question will burn out by the time the real campaign begins, so you can expect relatively little off-the-record briefing about when Cameron will leave. 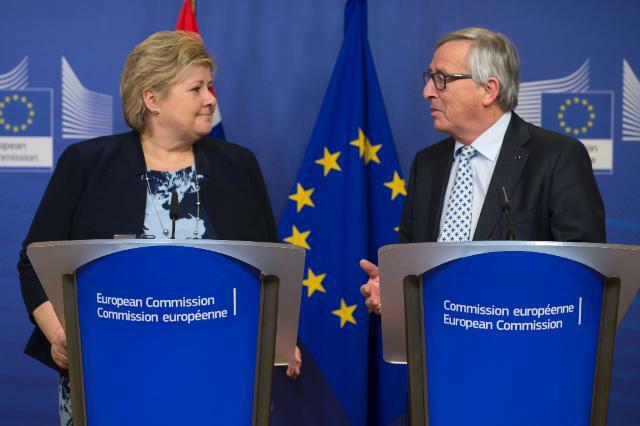 His casual remarks end the speculation, for example, that he might resign after the 2017 referendum or in 2018. After all, if he hangs on until 2020 as he hopes, he will have served as the Conservative Party leader for fully 14 years — just as long as the Iron Lady herself. 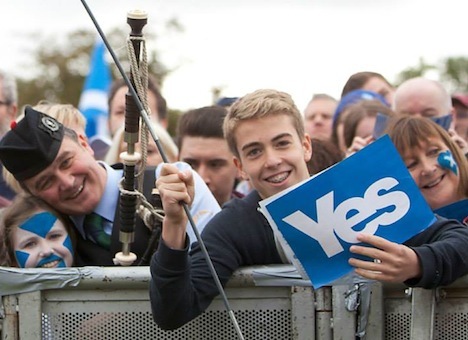 Scotland votes: Should it stay or should it go? The answer could change the economic, social and cultural outcomes of the lives of both English and Scottish residents for generations to come. Does Venezuela need its own Margaret Thatcher? Though the snap Venezuelan presidential election — just six days away — will likely have huge implications for the country’s economic policy, and though most economic commentators would agree that Venezuela is in dire need of economic reform, neither candidate seems especially keen on discussing those reforms in a campaign that’s been heavy on personality and emotions. But the negative aspects of legacy of chavismo — a growing public sector and nationalized industries, ever-expanding army of bureaucrats, widespread power outages, crumbling infrastructure — sound an awful lot like much of the problems that the United Kingdom faced in the late 1970s. Is Venezuela entering its own ‘winter of discontent?’ And if so, does it need a Margaret Thatcher? 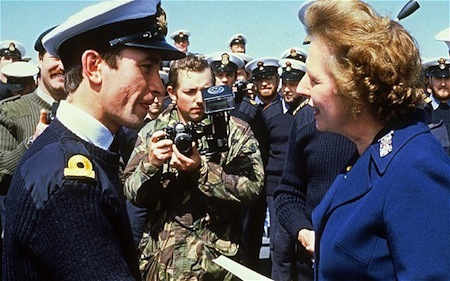 When it comes to South America, Thatcher is most well-known for the Falklands War against Argentina in 1982 (see Thatcher pictured above during that war). But one Venezuelan blogger has already argued that Romuló Betancourt, the first democratically elected president of Venezuela in 1958, was its ‘Thatcher.’ Betancourt’s major contribution was normalizing democratic elections and peaceful transfers of power, an institution that has so far continued in Venezuela without interruption, even throughout the chavismo era. Economically, the Betancourt government’s most notable achievement was land reform that boosted rural peasants. Perhaps the better example of Thatcherite economics in Venezuela is the second term of Betancourt’s successor (and one-time interior minister) Carlos Andrés Pérez (pictured below). 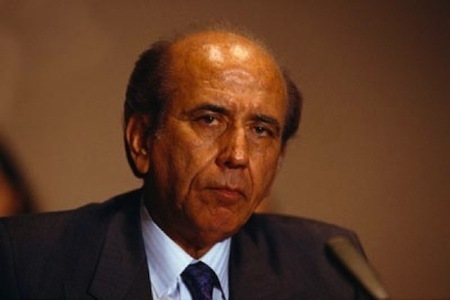 Despite presiding over the largesse of the oil bonanza that to the rest of the world was an oil crisis, Pérez (or ‘CAP’) returned to office with high hopes that he could unlock another era of plenty on a relatively populist campaign built on empty promises. Upon election, he rapidly sought a $4.5 billion loan from the International Monetary Fund, in return for crushing reforms that included a tax overhaul, a reduction in tariffs and custom duties and privatizations of state-owned companies. But those reforms (the ‘paquete‘ or the ‘package’) most controversially caused the price of gasoline prices to rise (and the secondary price of public transportation) due to the elimination in Venezuela’s famous gasoline subsidy — to this day, Venezuelan gas prices are the lowest in the world, and Venezuelans believe cheap gas is practically a birthright. Until then, Venezuelans had seen themselves as different, more civilized, more democratic, better than their Latin American neighbors. Thirty-one years of unbroken, stable, petrostate-funded democracy had made us terribly cocky. In a sense, the riots market Venezuela’s re-entry into Latin America. The country was no longer exceptional: just another hard-up Latin American country struggling to put its democracy on a stable footing. Those riots ultimately led to the dismantling of Venezuela’s two-party system, CAP’s impeachment in 1993, and two coup attempts in 1992 — one in February 1992 by a little-known lieutenant colonel named Hugo Chávez, who would of course take power by democratic means just six years later in a landslide election victory. So if Thatcherite policies ultimately paved the way for chavismo, could chavismo pave the way for a countervailing turn back to neoliberal reforms? Fast-forward two decades, and the country with the world’s largest proven reserves of petroleum finds itself with a budget deficit last year that equalled 17% of GDP and a public debt burden that’s now equal to 50% of GDP. So if he wins the presidential election, Chávez’s anointed successor Nicolás Maduro will have far fewer economic tools at his disposal than Chávez did to achieve his goals. Opposition candidate Henrique Capriles certainly isn’t going around the country advocating the elimination of gasoline subsidies, but Capriles seems far likelier than Maduro to enact the kind of policy reforms that could balance Venezuelan finances back toward a more stable equilibrium. But say what you will about the positive aspects of chavismo in reducing poverty in Venezuela and giving voice to a largely forgotten underclass excluded from the country’s oil wealth for a half-century, Venezuelan finances are hardly in great shape, and the winner of Sunday’s election will face significant financial pressures — all the more so if oil prices fall over the next six years. We all woke up in the United States this morning to the news that Margaret Thatcher, the former prime minister of the United Kingdom, died at age 87. There’s not much I can add (Andrew Sparrow’s live blog at The Guardian is a good place to start) to what will certainly be a week’s worth of paeans to someone who was undoubtedly the most consequential British prime minister since Winston Churchill — and, serving fully 11 years from 1979 to 1990, the United Kingdom’s longest-serving prime minister in the 20th century. Friends in the Health Service told me that by the mid 1980s, psychiatrists engaged in the early diagnosis of their more disturbed patients ceased asking them for their own names and birth dates and so on, and asked instead for the name of the prime minister. If patients failed to remember that, they knew they were properly sunk. 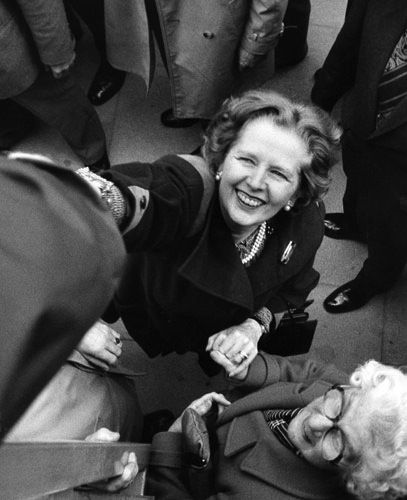 You’ll hear over the next 48 hours the extent to which Thatcher changed Great Britain, Europe and the world, but most immediately, it’s remarkable the extent to which she changed the Conservative Party. Her influence still lives on today in Tory prime minister David Cameron’s government in the same way that Ronald Reagan’s ghost hovers the Republican Party, even today, in the United States. It’s not just that she was a woman in a party of old men — German chancellor Angela Merkel won’t likely go down in history in the same breath as Thatcher. It’s not just that she came from a humble background in a party of aristocracy — her predecessor Edward Heath came from an even more humble background. It’s that she in many ways was the first truly conservative prime minister of Great Britain, in that her free market fervor really represented a radical departure from the paternal ‘One Nation Tory’ stance of her predecessors. It’s easy today to forget just how truly broken the UK economy had become in the late 1970s under Labour — strikes, inflation, economic malaise, rubbish uncollected in the streets. But she inherited a Britain that had reached a post-war nadir, and that turned around in her time in office. She so transformed British politics that Labour prime minister Tony Blair, when he came to power in the landslide 1997 election, was essentially a Thatcherite — he not only pulled the Labour Party (‘New Labour’) far from its trade union roots, but he arguably pulled it to the right of the Old Tories under Heath and Macmillan. The essence of Thatcherism was to oppose the status quo and bet on freedom—odd, since as a prim control freak, she was in some ways the embodiment of conservatism. She thought nations could become great only if individuals were set free. Her struggles had a theme: the right of individuals to run their own lives, as free as possible from the micromanagement of the state. Photo credit to Denis Thorpe of The Guardian.